"If you want the honeymoon retreat of all time, or else want to slip away for an illicit week, consider this oasis near San San Beach and the Blue Lagoon. It is the ultimate fantasy retreat. It's small and exclusive, standing on a 2-hectare (5-acre) private estate. 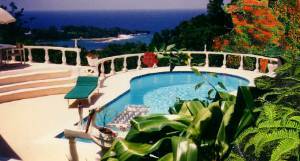 On the Million Dollar Player show, the estate was twice chosen as the grand-prize destination. Even Jamaica's usually reserved Daily Gleaner has acclaimed the property as "a dream house, a place of serenity"-and so it is. Many feature films or TV shows have used the setting as a backdrop, including Lifestyles of the Rich and Famous. Its crystal-clear, rainbow-tiled, and fountain-fresh swimming pool is reason enough to check in. In the courtyard is a spa with thermo hydra jets and mini-waterfalls. 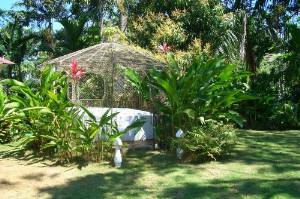 A second spacious heated spa is set in a secluded garden gazebo hideaway. 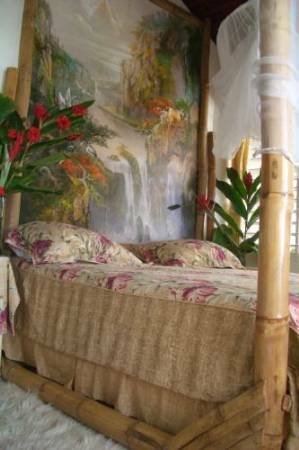 The living quarters are spacious and beautifully furnished with a certain elegance and much comfort. Breakfast in bed is a daily option. You've also got your own butler and nanny (housekeeper being the more politically correct term)." "Lavish dinners can be arranged in the tented dining room, with a white-gloved butler in attendance at the candlelit setting. 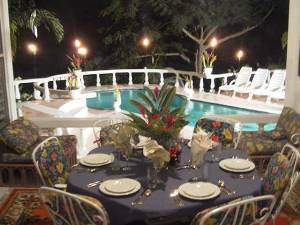 You can also dine alfresco by the pool with lighted Tiki torches. 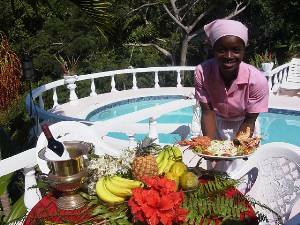 The tropical setting is one of fruit trees and lavish flora, with fountains and fish ponds." 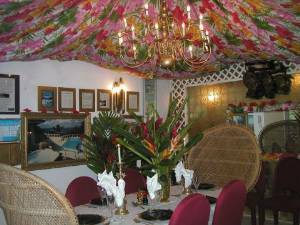 Why are most of Life Styles Of The Rich And Famous episodes filmed in Port Antonio? The answer is they have all discovered that this is the most beautiful, peaceful and unspoiled area in all Jamaica, further, those who know have found that the Chateau en Exotica is truly a fabulous dreamy Eden which is a secure gem and totally private paradise bubbling with numerous and delightful amenities in Port Antonio's crown of beauty To mention a few of Chateau's amenities, an always crystal clear rainbow tiled and fountained fresh water swimming pool, two romantic spas, one with thermo hydra jets and mini waterfalls set in a lush central courtyard, a second large heated spa set in a secluded garden gazebo hideaway. 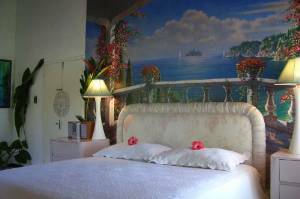 Three in-suite air conditioned, flower bedecked bedrooms with splashing FOUNTAINS, & personal mini refrigerators and full baths.